The Application period for the 2019 Community Service Award is now CLOSED! Please look for applications for the 2020 Community Service Award in the winter of 2020. The Junior League of Greenwich Community Service Award is granted to a young woman in grade 9-12, who either lives in Greenwich or attends school in Greenwich. 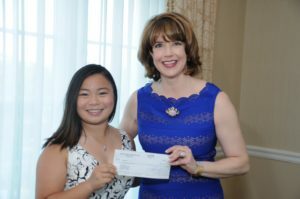 The grant is intended to recognize a student who exemplifies the mission of the Junior League of Greenwich and has clearly demonstrated initiative, leadership and a sustained commitment to community service. The Community Service Award Winner(s) will be recognized and presented with a monetary award of $1,000 at the Junior League of Greenwich Annual Dinner in May. Christine plans to use this award to create a fund for the repair of instruments at Waterside Elementary. 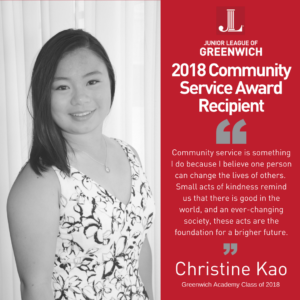 Christine graduated from Greenwich Academy in May and will continue to serve her community at Georgetown University next year. Congratulations Christine Kao and thank you for making an impact in our community!